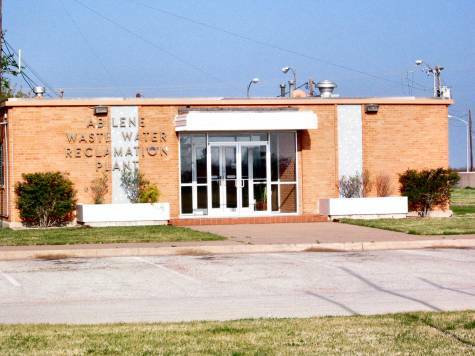 Please note: The Waste Water Treatment Plant is no longer required to keep water on the sludge. Therefore ponds don’t always contain water. 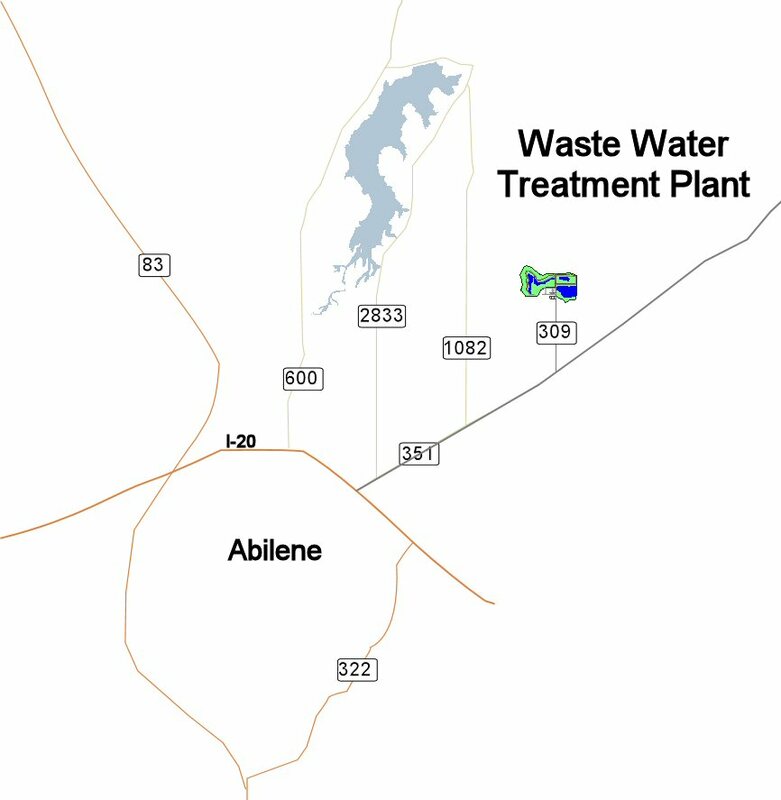 Please call the plant (see number below) or our hotline (325-691-8981) to inquire if the ponds are holding water. As August, 2007, all ponds have water and birding is good! 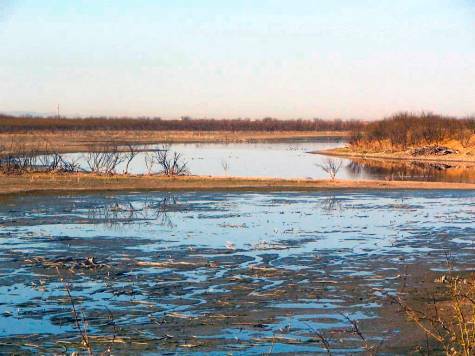 This spot is Abilene’s best for consistently seeing shorebirds and waders. Located in Jones County, access is from Highway 351. From the intersection of I-20 and 351, drive NE on Hwy. 351 for approx. 5.2 miles. Turn Left onto CR 309 and travel North (about 1.5 miles) until you come to the facility. Be sure and take your time birding CR 309; interesting birds can be found along the sides of the road (Golden-fronted Woodpecker, Greater Roadrunner, Loggerhead Shrike, Yellow-billed Cuckoo, assorted flycatchers) and flying over the fields. Stop at the culvert and look for shorebirds and waders if time allows. One must stop in at the office (indicated by a red square on the map below) and get permission from City personnel to unlock the gate (security measures after 9/11). Personnel have always been cooperative but you may have to patiently wait until they can unlock the gate. You may call ahead (325-548-2237) to let them know you will be out to bird, but they still wait until they see the whites of your eyes to unlock the gate. If the office is vacant when you arrive either call the above number or wait and someone will notice and come to help you. There are three ponds that hold water (see map below text). Pond #1 is usually half full of water creating lots of shorebird habitat. Pond #2 holds only water that comes from above (so it’s usually mostly dry), and Pond #3 is usually full. You can access Pond 1 and 2 by car but getting over to Pond 3 is a bit tricky and requires a high clearance vehicle. The brown lines on the map indicate dirt roads on top of the dikes. Please note, the dikes are constructed of West Texas clay so if they are muddy from rain or snow DON’T drive the dikes! We wouldn’t want you to slide down the embankments or get stuck. As of August, 2007, the road around pond 3 was not mowed (growth is over 6 feet tall) and several places were deeply eroded. I did not drive it nor would I recommend you drive it. How to access Pond 3 from Pond 2: At the northwest corner of Pond 2 make a sharp turn to the right (east) and travel down the dike. Make a U-turn almost immediately and travel west (think of it as a switchback). You’ll see a barbed wire fence and gate; unhook the gate; go through the gate, and then rehook the gate (don’t let the cows out!). Then drive up the dike and make a right turn as you top the dike. 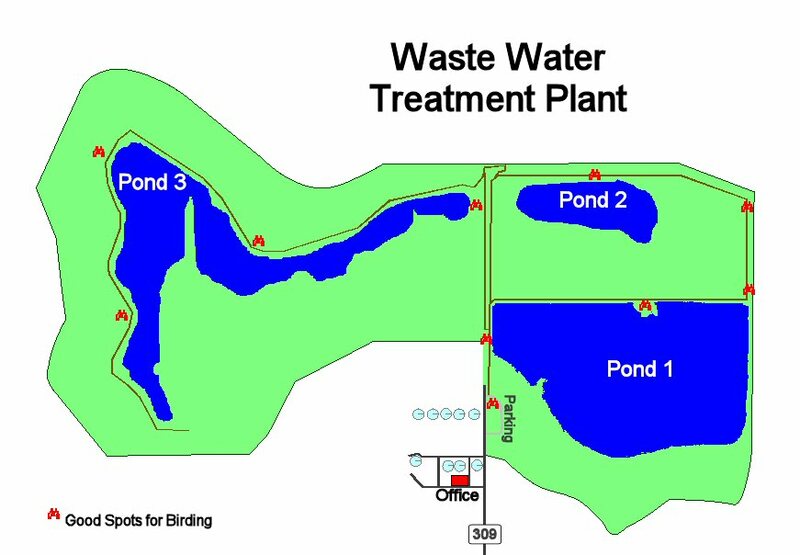 You can also access Pond 3 from Pond 1. You’ll see a sloped road that angles off the dike toward the west, then travel north until you get to the aforementioned barbed wire gate. Roads aren’t maintained consistently and if you don’t want to take your car out on the dikes, park in the area as indicated on the map and walk. After all, a little walking is part of a birder’s constitution. Please notice that Pond 3’s road dead ends. You must make a Y-turn and come back the way just traveled. Please watch out for the cattle; they frequently stand around on the dikes. And have I mentioned rattlesnakes? Just watch where you put your feet. If we haven’t deterred your birding enthusiasim, read on for a partial list of what could be out there. We’ve recorded Black-bellied, Snowy, Wilson’s, and Semipalmated Plovers, Stilt, White-rumped, Least, Baird’s, Western, Semipalmated, Pectoral, Buff-breasted, Solitary, and Spotted Sandpipers, Willet, Greater and Lesser Yellowlegs, American Avocet, Dowitchers, Wilson’s Snipe, White-faced and Glossy Ibis, and Black-necked Stilt. Black-bellied Whistling Ducks breed here and in the winter almost all species of ducks can be seen. Passerines in the fall migration include Nashville, Wilson’s, Orange-crowned, Common Yellowthroat, and Yellow-rumped Warblers, Blue Grosbeak, Bullock’s and Northern Orioles, and Dickcissels. Spring migration brings Clay-colored Sparrows, Brewer’s Blackbirds, and Yellow-headed Blackbirds. Common Moorhens have been found on Pond 3 along with Green and Little Blue Herons, Black-crowned Night-herons and Yellow-crowned Night-herons. Snowy, Cattle, Great, and Tri-colored Herons also put in appearances from time to time. Swallows gather here in fall migration as would be expected with an occasional Tree Swallow found in fall migration. Raptors recorded here include Osprey, Peregrin Falcon, Red-tailed Hawk, Northern Harrier, American Kestrel, Red-shouldered Hawk, Cooper’s and Sharp-shinned Hawk.